If you’ve been active in the PC community for any amount of time, you without a doubt know what Steam is. If you don’t then I’m genuinely worried about you. For those worrisome few who don’t know, Steam is the biggest digital distribution platform available on PC for gaming and more recently indie movies as well. Being that they are the biggest, most popular choice for gamers to buy their games, they also hold one of the largest PC game review databases available online. Which brings us to our point. Steam’s review system has long been used by millions of gamers to determine whether or not a game is worth their time, and all throughout this Valve has constantly been looking for ways to improve the system. Over the years they’ve done things like adding a “recent” review score alongside the “overall” score, multiple ways to filter reviews, the ability to vote on reviews as a reader, and ultimately just a cleaner system. That system worked well up until people discovered that they can effectively “review bomb” a game if they disagree with something the developer has said, something done in/to the game, or even for completely unrelated reasons. What kind of unrelated reasons? How about bombing DOTA2 with negative reviews because Half-Life 3 hasn’t released yet? I mean, those games have literally nothing to do with each other outside of being the property of Valve; even if Valve, a multi-billion dollar company, was developing HL3 right now (chances are they’re not) it most definitely would not be the same team that’s working on DOTA2. …review bombs make it harder for the Review Score to achieve its goal of accurately representing the likelihood that you’d be happy with your purchase if you bought a game. To try and work against these… misplaced reviews… Valve has implemented another new addition to their already hefty review system, a histogram outlining both negative to positive reviews on both a month-month basis as well as daily for the past 30 days. Personally, I think this is a great system as review bombing is completely counter-productive and definitely not something I’m a fan of. Hopefully, the histogram will not only give us consumers more insight into how a game has progressed through updates and patches over time, but it also serves as a great visual representation of the negative vs positive reviews on a month-month basis. I don’t know about you, but I find the above graph easier to get an idea from when compared to reading a generalized percentage. 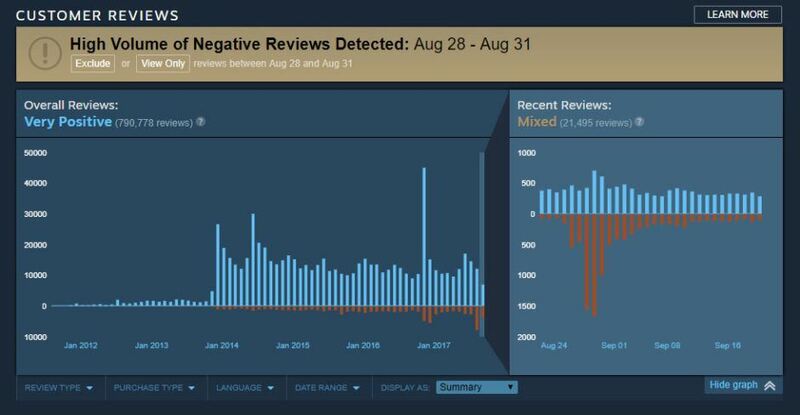 For instance, say a game had a really rocky start and got lots of negative reviews right out of the gate, but then patches were implemented, things were fixed, and it turned out to be a great game – you’re going to be able to easily see a sway in the blue vs red lines in the new graph. What makes the graph even better are the ways you can use it to filter reviews, say you see a spike in reviews during a set period, you can drag (or click) on the graph itself to select just that timeframe and see what people were saying. I find that very useful. Of course, you should still check out the reviews and read what people are actually saying, but the graph gives a quick and dirty look at how a game has been doing over time. Honestly, even if you’re not a fan of the histogram, it’s still a lot better than some of the other ideas Valve had been considering. In their announcement of this feature, one of the ideas they axed “could prevent reviews for short periods of time whenever we detect massive distortions in submissions” which would no doubt make a lot of people very unhappy. Luckily, Valve ran into logistical problems with that idea and didn’t like how it restricted user’s ability to voice their opinion. Another idea was “to simply remove the Review Score” which again wouldn’t be any good for anyone, especially not when it was originally implemented due to a massive amount of requests in the first place. Personally, I think it’s a good balance given they had to do something and the options were limited. What are your thoughts? Do you think the new system is good? Bad? Why? Let me know in the comments!